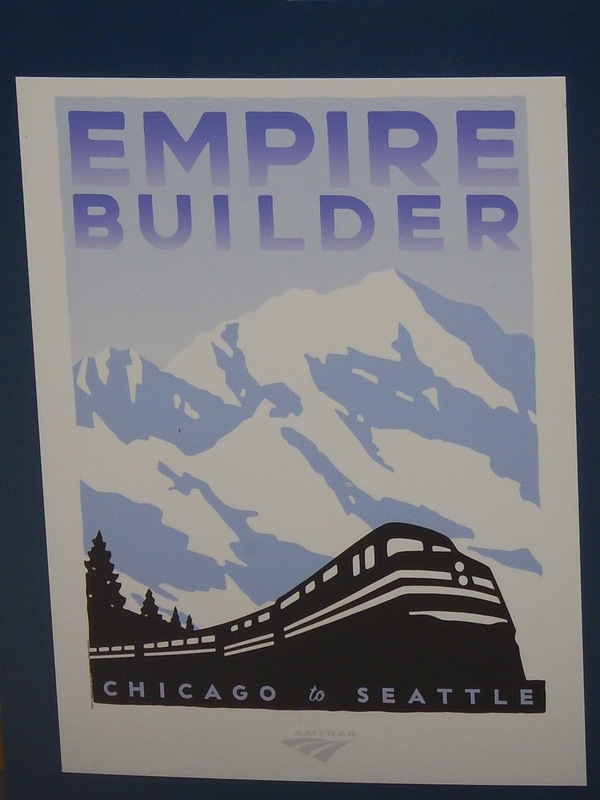 Having enjoyed our days in Chicago it was quickly time to make our way back to Union Station to board The Empire Builder for our journey to Glacier National Park, Montana. We checked our bags and took advantage of access to the Metropolitan Lounge, an exclusive waiting room offering comfortable seating and complimentary refreshments. We got talking to an Amish couple who were on their way to Denver, they were very interested to talk to us about England and Brexit and before we knew it our train was being called and we hadn’t had a chance to grab a snack for lunch! Unlike the single deck, Viewliner, Lake Shore Limited train we took from New York The Empire Builder is a Superliner, a double-decker train with a glass domed observation car. Out Roomette was on the top deck, it wasn’t any bigger than the previous one but it didn’t have a toilet which we decided was a good thing. There were toilets and showers on the corridor, a constant supply of ‘fresh’ coffee and regular delivery of cold bottled water. Feeling like old hands we settled in for the longest single stage of our journey across the states, 1596 miles scheduled to take 28 hours. We left Chicago and travelled up the west coast of Lake Michigan to Milwaukee (passing the Miller Brewery) then turned west to cross Minnesota via the twin cities of Minneapolis/St Paul. About 19.00 we headed to the dining car for dinner (we were starving by then having missed lunch), we shared a table with a couple from Michigan and quickly struck up a conversation about travelling and different places we had all been to. As we chatted we enjoyed views of a very pretty lake, not ever so wide but long and certainly big enough to sail on, except it wasn’t a lake, it was the Mississippi River, we couldn’t believe how big it was so far North. Apparently Minnesota is known as the land of 10,000 lakes and we really enjoyed the scenery as we passed through the state. In due course darkness fell, the car steward made up our beds and we settled in for the night, it isn’t the most comfortable way to travel and I’m glad we are only doing one night at a time but we are really enjoying travelling through the country rather than flying over it. Every now and then we pass a small town and see kids in parks and people going about their daily business, it’s almost like having a secret window on their lives as we pass by. We woke up in North Dakota, who knew that the east of the state looks just like the fens, very flat, lots of wetlands, just like home! Mark was amused to discover that we stopped at Rugby North Dakota, and took a picture particularly for Steve’s benefit; Rugby ND doesn’t look anything like Rugby UK!! As time passed the landscape changed, first to rolling farm land planted with maize, sunflowers and as we travelled west more and more wheat until all we could see as far as the horizon was endless huge wheat fields and combine harvesters cutting the crop in wide strips. Eventually the wheat gave way to open prairie, coarse grassland with dramatic rock escarpments in the distance and small herds of Black Angus cattle grazing free range. We kept our eyes peeled hoping to spot herds of Bison, apparently there are some out there but we didn’t see any. We did see eagles and deer and a lone coyote. Late on Wednesday evening (we were running about an hour late by then) we suddenly saw the Rocky Mountains looming on the horizon, the transformation was dramatic and out of nowhere we saw flocks of Magpies, the first we have seen here – if one is for sorrow and two for joy does anyone know what 16 means? At 19.30 we arrived at our station, East Glacier park. We got off the train feeling a bit stiff (its along while to sit down and it’s not easy to walk around while the train is moving) and slightly dazed from the journey. To our delight the Glacier Park Lodge was immediately in front of the station. There was a man there to take our bags and we could have had a lift to the hotel but we chose to walk up the path across the front lawn and along the edge of a beautiful flower bed to get to reception. The air was clean and clear and straight away we started to relax. Sounds like you’re having a great time. Like the sound of Glacier NP just added it to my list.